$5 On Fifth: What Hath the Economy Wrought? Although the blatant designer knock-offs are banished and someone will always whisper "louisvuittonpradafendi?" to you on Canal, Fifth Avenue continues to do a swift street business. 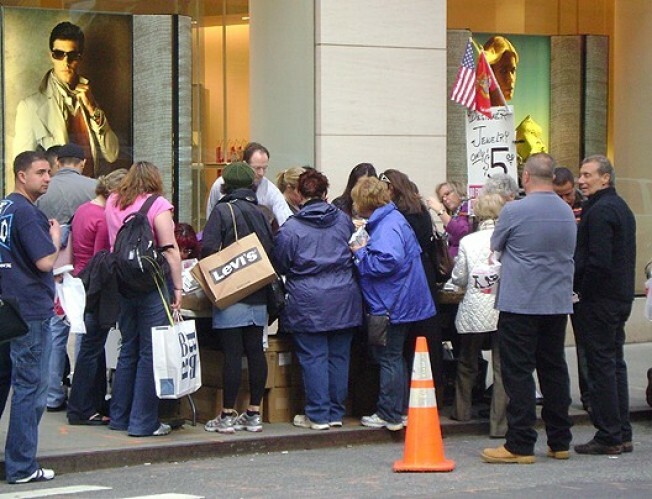 Pop-up vendors are occasionally helping more customers than the even busiest sweatpants sales associate at Juicy Couture. We've seen it over and over again this spring: tables of jewelry, mini perfumes, and the requisite pashminas all priced at $5. The images above are only a small sampling, and note the fervor around the table billed as "designer jewelry." Of course such street vendors have always been popular with tourists, but we predict a rising interest in shopping them among locals, who would previously (that's pre-recession) have headed straight to a boutique to pick up some throwaway costume jewelry or a wrap scarf. In the meantime, we'll keep our eye open for when the prices decrease to $3, for it's then that we'll know everyone's hurting.